A new retail concept is set to break ground in London this summer in hopes of bringing on a revolution in shopping. A pop-up mall built from shipping containers will land in Shoreditch on a former railway goodsyard this August. Only small brands will be featured in this edgy new retail experiment along with hip cafes and galleries to nurture the community and create an enjoyable place to do more than just shop. 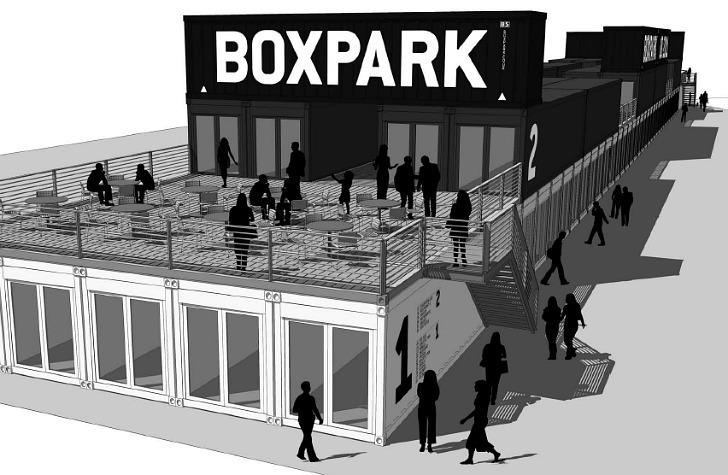 Because the mall is built from shipping containers, Boxpark Shoreditch is also moveable and will eventually travel around the world to other hip locations. The two-story mall will feature 61 container shops for various local brands that are hand-picked and invited to participate. Preferential and affordable rates ensure that a wide selection of retailers and goods are showcased. Even local creative industries and organizations will have a chance to set up a shop at reduced rates to make sure that the mall enhances and nurtures the community space. The project was developed in a partnership between Roger Wade, Hammerson and The Ballymore Group and also has the potential to add 2,000 new homes, office space and more to the area. Located very close to a metro station in an already creative district, the pop-up mall is sure to bring in even more people and energize the area. Inspiration for the world’s first pop-mall comes from other shipping container pop-up stores and galleries like Puma City, the Melbourne Activity Center, the Freitag Store and Platoon Kunsthalle. Patios built on top of the first floor will provide space for outdoor seating, cafes and performance areas. The retail revolution via pop up mall is set to open in August of 2011. The two-story mall will feature 61 container shops for various local brands that are hand-picked and invited to participate. Preferential and affordable rates ensure that a wide selection of retailers and goods are showcased. Even local creative industries and organizations will have a chance to set up a shop at preferential rates to make sure that the mall is enhancing and nurturing the community space. 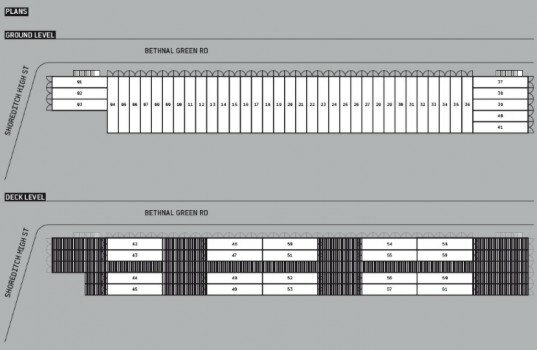 Suggested layout of a 40' container for a retail shop. The project is developed in a partnership between Roger Wade, Hammerson and The Ballymore Group and also has the potential to add 2,000 new homes, office space and more to the area. Located very close to a metro station in an already creative district, the pop-up mall is sure to bring in even more people and energize the area. The long row of containers are open to the exterior to form an open air mall of sorts. Inspiration for the world's first pop-mall comes from other shipping container pop-up stores and galleries like Puma City in Boston. Platoon Kunsthalle in South Korea.